"One of the year's best films!" - Wheels loves MANDY (starring Nicolas Cage)! It's hard to imagine anyone but Nicolas Cage in the lead role of "Red Miller" in MANDY. It feels like his entire career, the prestige pictures like LEAVING LAS VEGAS, the slightly campy yet earnest action vehicles like FACE/OFF, and the films full of gloriously over the top performances that snubbed their nose at traditional ideas of acting such as BAD LIEUTENANT: PORT OF CALL NEW ORLEANS have all gone into crafting the only actor alive who could carry the utter insanity of MANDY. MANDY is the second feature from writer/director Panos Cosmatos (BEYOND THE BLACK RAINBOW). Here he takes his unique visual sensibilities and applies it to a revenge picture framework. The story of Red Miller’s quest for revenge against the religious cult that kidnapped and murdered his love , the titular Mandy (played by an otherworldly Andrea Riseborough) feels from its description like typical genre fare but the details are where it really comes alive, MANDY's tone and visual style feel as if Paul Schrader's ROLLING THUNDER and George Miller's MAD MAX took place in a Hieronymus Bosch hellscape that was airbrushed by fantasy artist Boris Vallejo onto the greatest 1980's heavy metal album cover you've never seen. It is nearly overwhelming at times. The visuals are lush and occasionally color seems to pour over every inch of the frame yet at other moments the film will shift to a scene of muted colors, harsh lighting, and something approaching reality or it will go even further into the surreal until it actually becomes a HEAVY METAL-esque animated sequence. All of this visual intensity is accompanied by a pulsing score by the late Johann Johannsson that adds to the feeling of tension throughout the early parts of the film and adds energetic propulsion to the gore soaked back half. MANDY has such a unique blend of visual and sonic elements that it could have easily taken away from the story being told but the film is anchored beautifully by the cast. Which brings us back to Nicolas Cage. 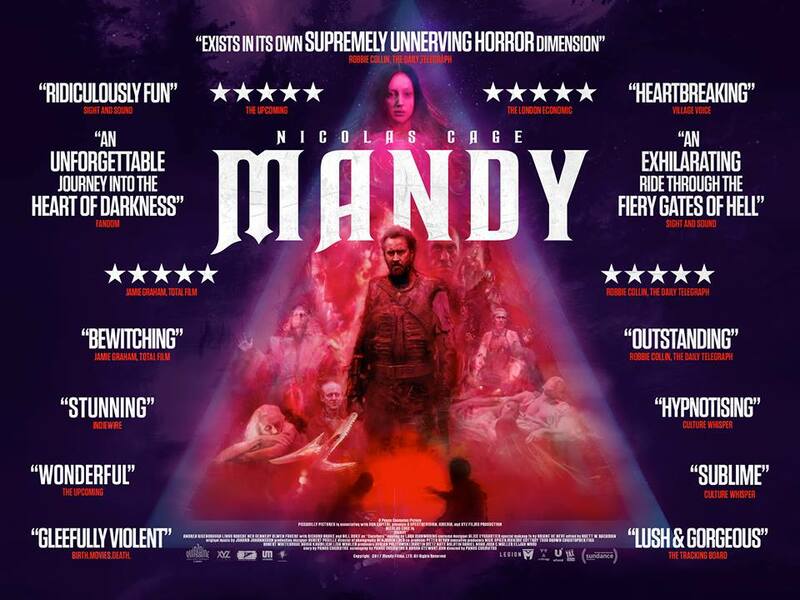 I'm sure many people will look at the advertising and early critical reactions to MANDY and assume that Cage is at his most over the top here and in a film where he fights a mutated biker gang with a battle axe that looks like it was designed by H.R. Giger that's to be expected and anything less would frankly be a little disappointing. Cage, however, plays large parts of the film with a quiet intensity and once you see what he's doing here you know it was the right choice. Make no mistake, there are some truly great "mega acting" moments from Cage that will not escape internet mockery. Those who do that mockery though, are missing this fundamental truth about Nicolas Cage; he is the only actor working today who can make a scene, like the one that follows the attack on Red and Mandy that leaves her dead and him on the path of vengeance, actually work. The scene entails a wounded Red, mourning his loss, downing a bottle of vodka while patching himself up and sobbing uncontrollably. It's a brave scene that Cage is magnetic during because of the way he plays it like a man just barely clinging to his sanity. His choice to go big there feels fitting and I firmly believe any other actor would have floundered at that moment and brought the film to a grinding halt. Cage's performance wouldn't matter if you didn't sympathize with his plight though. He and Riseborough, in the early parts of the film, fully establish Mandy and Red as a couple who love each other deeply and have reached that comfortable stage that all good relationships fall into. Their life together is cozy and safe. Their scenes together are played sweetly and understated. So, when they run afoul of cult leader Jeremiah Sand, played by a slimy Linus Roache (BATMAN BEGINS), and the worst happens, we understand Red's intense reaction. Roache is suitably sleazy and unhinged as Sand and his performance is fearless and bold to match Cage's work as Red. Roache is unafraid to go to really weird places here and the film is better for it. He is a despicable antagonist and excellent as a man so sure of his own righteousness that he can't see that he created a destructive force of nature in Cage's axe-wielding Red. Sand believes his followers and the aforementioned biker gang, The Black Skulls (who look like what you would have if HELLRAISER’s cenobites started a motorcycle club) , are enough to protect him from reprisals. Cage though is unstoppable as he rips through the back half of the film destroying anything in the way of his vengeance. This part of the film is well choreographed during the action scenes and when it comes to the violence, MANDY is unapologetically gory and visceral. This is easily the most violent film of Cage's career and there are moments of violence and gore on display here that I'm certain will delight midnight movie fans for years to come. Under all the mayhem and surrealism though is a wonderful fable about loss and rage held together by great performances from the film's three leads and elevated so much by the unique approach of Panos Cosmatos. MANDY is destined to be a cult classic and is easily one of the best films of the year. 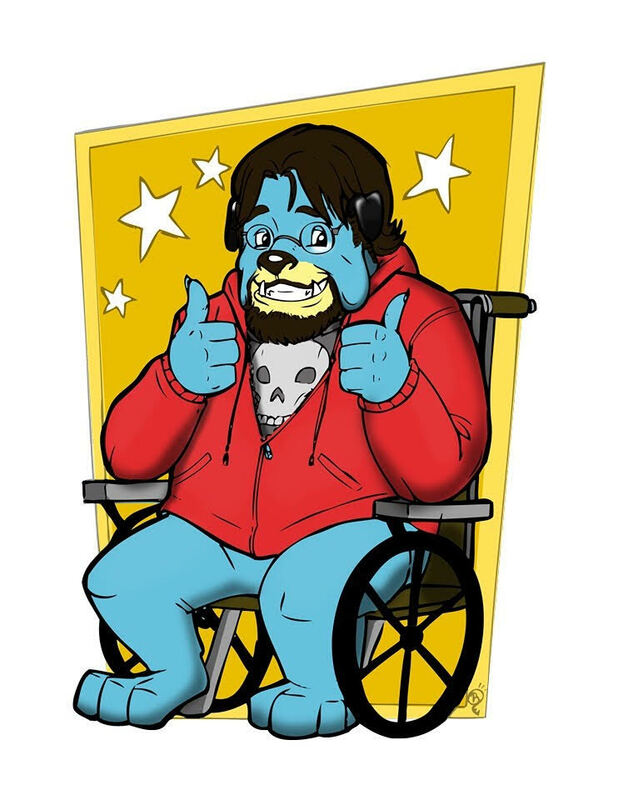 I strongly encourage any genre fan to seek it out as soon as possible.